My cousin Martin lives a clay-tiled house on an island in the Baltic Sea. Set back from the road, or what they call a road, a single lane of concrete slabs placed one after the other an axle-width apart, the house is one of four or five on a stretch of land above the shore. 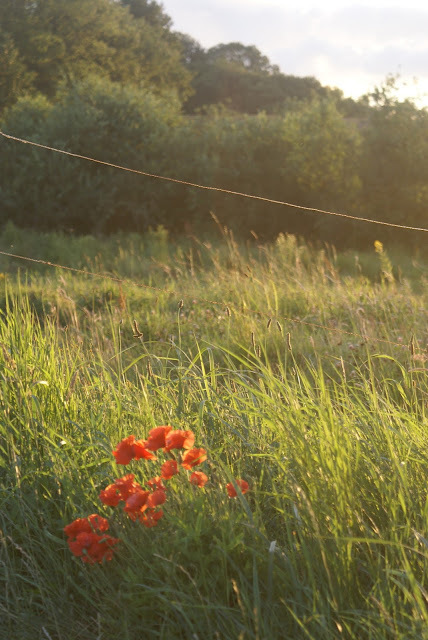 It’s summer and the wildflowers are in bloom, the colours like a Monet painting: poppy red, cornflower blue, camomile white, and the faded green of long, dry grasses. Martin sent me a text four hours ago, inviting my daughter and me to dinner. 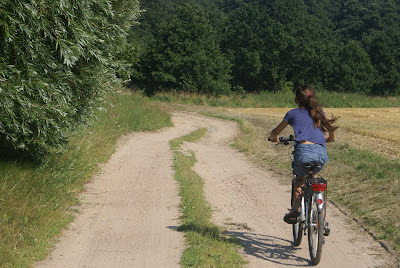 On bicycles, we rode from our rented cottage down the sandy path that winds through the wheat fields and joins with the lane that leads to his house. Other guests arrive carrying bowls of lettuce leaves from their gardens, cardboard boxes of cucumbers, or freshly shelled peas. They greet us and kiss our sunburnt cheeks before leading us into the crowded kitchen where we lean against counters stacked with bone-coloured crockery, painted vases, open books, loose sheet music, cutlery, bread rolls, sliced watermelon, and cartons of dairy products. We talk and laugh as if we do this every weekend, but I have never been here before and I do not know my cousin. I look at his face in the grainy light to see what features I might recognize: a strong jaw line, a crooked smile, slate blue eyes behind dark-framed glasses. He is of my father’s stock, an ocean away, a generation removed. My father and Martin’s mother grew up in northern Germany at the height of the second world war. Before my father turned fourteen, his parents were dead, his siblings scattered, his country devastated. He escaped to Hamburg, paid for passage on a boat, and sailed to Montreal. Martin’s mother, with whom my uncle Ernst was sent to live, soon married Martin’s father. 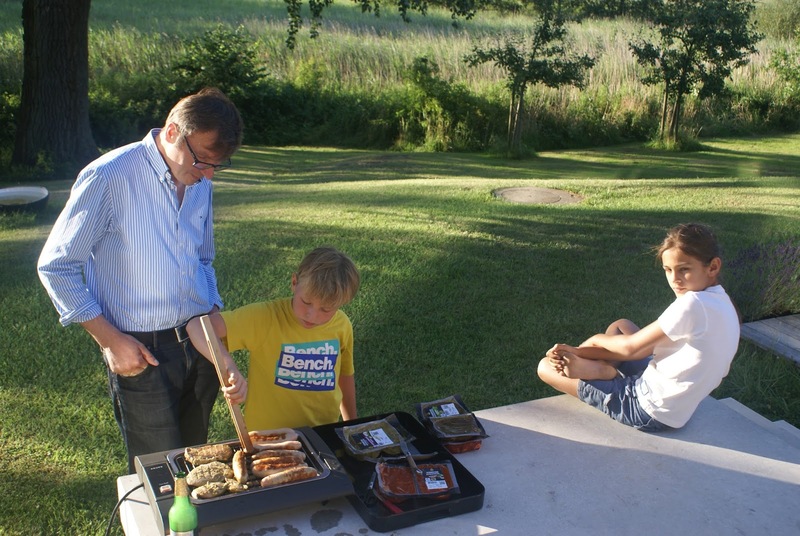 They moved to Rügen, this farming island, so his father could take his first government post. Shortly afterwards, the Berlin wall went up and Martin came into this world. After the men decide it’s time to grill the meat, Karen, Martin’s wife, calls me over to the window. I cannot help but like this woman. She’s a lightly-freckled, ginger-haired Saxon with a quick smile and a voice that sounds like home. “Would you look at them,” she says, pointing to our children jumping together on a trampoline. They’re gangly kids at an awkward age, too tall for their motor skills. They’re bouncing wildly and acting silly, pretending not to be afraid. Karen speaks in a dialect I don’t always understand, but her face tells me everything plainly. We watch a moment longer before she goes back to the counter to arrange pastry on a baking sheet. “What can I do?” I ask and am handed an electric mixer with brief instructions to mix mascarpone with quark and whipping cream. The other women decide to pick sour cherries in the yard so only two of us are left in the kitchen. “Your hair is still wet,” I say to Karen, who smiles apologetically. I laugh and try to imagine myself swimming naked in public in front of friends and neighbours. Would I do it too, if I lived over here? I doubt I would be the exception. I turn on the mixer recalling last Sunday when I was introduced to Martin at his parents’ house, at the table where he ate his childhood meals. He seemed astonished to meet someone new, a woman from Canada whose father knew his mother when she was young. After coffee, he drove us in his black Mercedes to a thirteenth century church to view an art exhibit. Dinner is served outside on a table covered with a blue damask cloth. While we feast, the light around us dims. The sky pales then turns purple then midnight blue. Beyond the yard is an expansive meadow, an hypnotic space of wild beauty over which the cormorants fly. After we finish, Karen gets up to light a cigarette while her son Max disappears. I pay no attention until minutes later I hear a startling sound, a single note of music, coming from above. It’s Max on the deck, a metal stand in front of him, a gleaming clarinet in his hand. He begins to play, and I think of conversations I overheard as a child about my father’s family. They couldn’t leave, they couldn’t talk freely, they couldn’t buy a car. In 1981, for the first time, my brother visited our uncle Ernst at his apartment in East Berlin. I saw a photograph of two of my cousins, little girls then, climbing on the shoulders of my 20-year-old brother, tall and tanned and muscular. They look happy, I thought and was surprised. As the air fills up with Max’s music, I sink in my chair and let the notes settle over me like a warm blanket. We move inside when it gets too dark to see and settle on leather couches. While my daughter stretches out and falls asleep, Ernst passes around a box of chocolates. There are two generations next to me who lived through the fall of communism. “How much has it changed?” I ask when everyone seems relaxed. Martin’s father looks at me but doesn’t answer. “Not much,” he then says while Karen says “A lot”. We all laugh awkwardly. “But we didn’t live much differently,” Martin’s father says. Indeed, they still live in the house where Martin was born, have the same garden, the same friends, the same interests. “But you have a business now,” I say. In 1991, Martin’s father left his government job to sell machinery to farmers on the island. Now he and Martin are co-CEOs of a company that supplies steel and other building materials, designs, and installations to companies all over the country. “Yes. He works very long hours now,” Martin’s mother says. A guilty smile spreads across Martin’s father’s face as he tilts his head to look at his wife. It’s a little bigger than the house we’re sitting in, but not ‘very big’ by North American standards. “Big enough,” is what I tell her. Martin smiles at me. “That’s a good answer,” he says. We leave around midnight when Martin’s mother offers us a ride home. The whole way we don’t see another car and the darkness induces old dreams: if my father had never left Germany, who would I be now? Would I be living on Rügen, near Martin and Karen, among the wheat and the wildflowers? It’s been too quick, the way I’ve become accustomed to life on this pretty, strange island. I close my eyes and hear a clarinet’s note, clear and crisp in the cool night air. Pamela Hensley is a graduate of the University of Western Ontario and the Humber School for Writers. Recently, her fiction appeared in The Dalhousie Review and she received an Honourable Mention in the Hamilton Short Works Prize. She lives in Ancaster, Ontario where she splits her time between writing and managing a consulting company.